Secret Service agent George Hickey is seen brandishing a rifle as the limousine carrying a wounded President Kennedy, with agent Clint Hill on the back, speeds away from Dealey Plaza in Dallas on Nov. 22, 1963. One theory is that Hickey accidentally shot JFK. A Secret Service agent accidentally shot President Kennedy in the head? 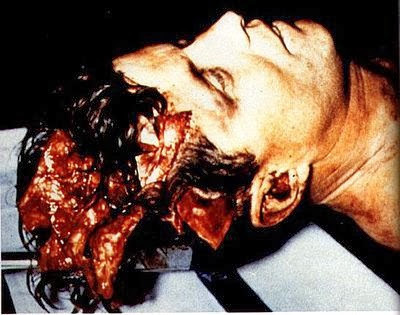 The main evidence for the theory, proposed in the 1970s by Baltimore gunsmith Howard Donahue and newly resurrected by Australian detective Colin McLaren, focuses on the third shot at President Kennedy, tearing apart the upper right side of his skull. JFK’s head wounds suggested to Donahue that the third shot was not fired by the Mannlicher-Carcano rifle found on the sixth floor of the Texas School Book Depository. Most investigators, including Donahue, believe that weapon, linked to Lee Harvey Oswald, fired the first two shots, if not all three. The way the bullet produced as many as 40 tiny fragments inside Kennedy’s brain, and the reported 6mm diameter of the entry wound in the back of the skull, were inconsistent with 6.5 mm Carcano bullets, Donahue contended. 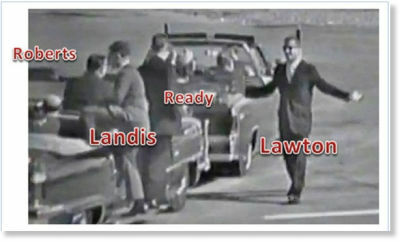 His analysis did agree with Specter’s “single bullet theory” that such a full metal jacket projectile was capable of drilling through Kennedy’s upper back and throat, and Texas Gov. John Connelly’s back, rib, and wrist before lodging in his thigh. But Donahue couldn’t comprehend such a bullet disintegrating inside a brain. His calculations put the trajectory over the left side of the trailing car, which was full of Secret Service agents, including one who at some point picked up an AR-15 rifle. Donahue concluded the agent, George Hickey, accidentally shot the president when the car suddenly lurched. The theory got little notice, despite a 1977 write-up in the Baltimore Sun and a 1992 book, Mortal Error: The Shot That Killed JFK, by Bonar Menninger. Donahue died in 1999. In the Reelz report, McLaren extends the case to argue that there was a coverup because the Secret Service was mortified that the president was killed by a man who was assigned to that car only because other agents allegedly had been partying and drinking until early that morning. No solid witnesses. McLaren makes a big deal of trusting witnesses, but more than 100 people there that day thought shots came from the Book Depository or the infamous grassy knoll. No one claimed to see Hickey discharge his weapon directly at the president. 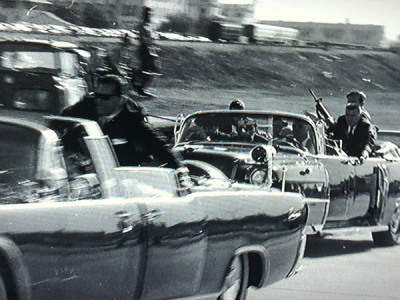 Yet JFK: The Smoking Gun discredits the grassy knoll idea (as does Cold Case JFK, Nova’s reexamination of the scientific evidence that debuts at 9 tonight on PBS), while giving credibility to those who smelled gun smoke at street level, who thought the third shot was louder or came from near the presidential limousine, or who thought Hickey may have picked up his rifle after the first shot (Hickey testified it was after the third shot). Hickey’s car had two administration officials inside, and seven other Secret Service agents aboard, counting four on the running boards while at least two Dallas motorcycle cops rode alongside. Behind them were more cars full of agents and officials. No one was sure that Hickey's AR-15 was fired in Dealey Plaza? Kennedy aide Dave Powers said, “Someone a foot away from me or two feet away from me couldn’t fire a gun without me hearing it,” according to Mortal Error. A coverup might produce such post-event denials, but what explains a lack of immediate reaction in the followup car? Wouldn’t a trained agent have snatched the gun, or knocked Hickey down, in case he was a real assassin? Or to prevent this klutz from killing someone else? It’s dubious to use a gaping hole to calculate a trajectory. If Donahue’s trajectory is wrong, his whole theory falls apart. Did the bullet enter near the base of Kennedy's skull (as the autopsy report suggested) or four inches higher (as the House Selection Committee on Assassinations concluded)? Then, did it travel toward the middle of the area with missing skull, or travel more toward the top, bottom, front or rear? A “completely disintegrated” bullet also confuses the trajectory. A big part of Donahue’s theory was that the third bullet “explosively disintegrated into dozens of tiny fragments.” That would fit the kind of bullets used by Hickey’s AR-15. Mortal Error quotes Russell Fisher, a Maryland medical examiner, as telling Donahue that “the bullet that hit him [Kennedy] in the head disintegrated completely,” judging from autopsy x-rays. So which is it? Did the bullet shatter to smithereens, or did it leave enough evidence to pinpoint a path? JFK: The Smoking Gun gives both impressions, poking a dowel through two holes in a model of a skull (above), and blowing up a cantaloupe with an AR-15 bullet. Forget about threading any dowel through that melon. And forget about the Carcano bullet piercing the cantaloupe neatly. Nova’s Cold Case JFK shows footage of skulls fracturing apart when struck by Carcano bullets. Carcano bullets did break apart in tests on skulls. Kennedy’s brain went missing after the autopsy, so no one knows if bullet fragments seen in x-rays from the autopsy add up to an AR-15 bullet or the lead core and other bits of a Carcano bullet. Two sizeable Carcano bullet fragments (above) were found in the presidential limo, and the Warren Commission concluded they were from the bullet that caused the head wound and that they damaged the windshield and its Chrome before dropping to the floor. The missing middle section might account for the dozens of tiny fragments seen on the x-rays. And the tests above on human skulls did produce deformed pieces resembling those found in the limousine. Donahue’s explanation is that the first shot missed, hit the pavement and ricocheted, with three fragments winding up in the limousine, including one that strikes Kennedy’s head, causing him to react before he and Connelly got hit by the second bullet. Donahue examined the two found fragments, and eliminated them as coming from the third shot, because he saw no brain-tissue residue, according to Mortal Error. And yet Donahue assumes the autopsy was precise about the entry wound diameter down to one-fiftieth of an inch. Further, it’s unclear if the 6 mm measurement applied to the bone itself since it was clearly given for a “lacerated wound” “in the posterior scalp.” When the report then notes “a corresponding wound through the skull,” is that a declaration it was the same size, or just in the same location? As Menninger notes, “Certainly, the scalp tissue may have shrunk.” The wound in Kennedy’s back and throat, agreed to have been from a Carcano bullet, was measured as only 4 mm wide in the autopsy report. The Warren Report said “elastic recoil of the skull” could explain the seeming discrepancy. Cover-ups can have many reasons. The autopsy was dubious, and evidence was lost, but that doesn’t make fatal friendly fire the only possible explanation. 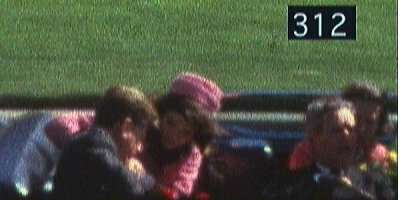 Losing the president was embarrassing enough to the Secret Service, and it’s widely suspected the FBI and CIA were covering up how much they knew about Oswald. The way the medical evidence was "rushed and bungled" allowed all sorts of conspiracy theories to arise, said New York Times reporter Philip Shenon, author of A Cruel and Shocking Act: The Secret History of the Kennedy Assassination. There’s a saying about quantum physics, that if you think you understand it, you probably don’t.